Nothing epitomizes the First World War more than the trench. Trench warfare prevailed on the Western Front from 16 September 1914 up until the Germans launched their Spring Offensive on 21 March 1918, a staggering 4 and half years in which deadly, grinding attrition became the norm. Casualties of the defenders often matched those of the attackers with the amount of ground gained usually being very small. Both sides were bogged down in a continuous line of trenches stretching from the Franco-Swiss frontier in the south to the Flanders coast in the north, a distance of over 450 miles. But how did this situation come about? In 1905 Germany drew up a plan to deal with a war on two fronts, the “Schlieffen Plan”. It was designed to deal with the likely, (and subsequently real), possibility of war with both France and Russia at the same time. The plan called for a swift strike in the west against France to knock her out of the war before turning to deal with Russia, which could be counted on to take a lot longer to mobilise than her French ally. 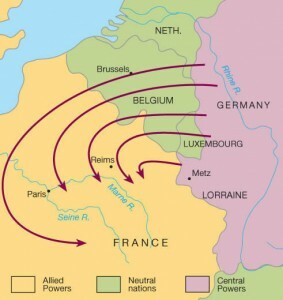 In the west the plan called for diversionary attacks in the Alsace region against the French to draw their forces away from a right hand strike through the Netherlands and Belgium where the German armies would then loop around the French capital, capture it and thus end the war. The plan that was actually put into operation in 1914 was little different to that drawn up by Count von Schlieffen in 1905 with one main modification, they did not violate Dutch neutrality on their right wing and attacked France only through Belgium. It was Germany’s entry into neutral Belgium that brought Britain into the war on August 4th 1914. Britain was bound by treaty along with a moral obligation to defend Belgium. Thus it was that the British Expeditionary force (BEF), along with some of the French army met the German right wing at Mons in France at the end of August 1914. Russia would take at least 6 weeks to mobilise. France would be easily defeated in 6 weeks. On 2nd August 1914, the German army invaded Luxembourg and Belgium according to the Schlieffen Plan. The Germans were held up by the Belgium army, backed up by the BEF (British Expeditionary Force) which arrived extremely quickly. Russia mobilised in just 10 days and Germany was forced to withdraw troops from the Schlieffen Plan to defend her eastern border. Germany did not take the chance to take Paris, instead decided to attack east of the capital. 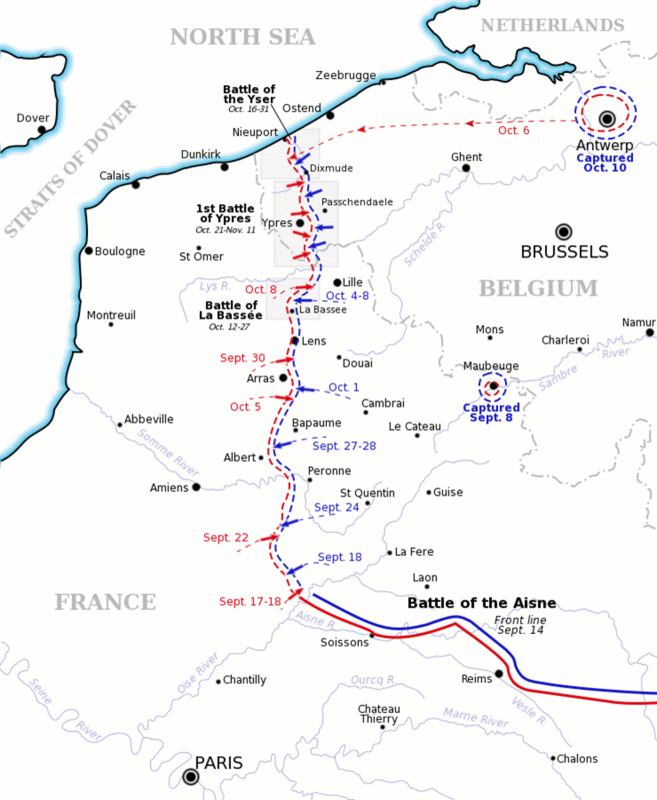 They were met by French at the battle of the Marne (5-11 Sept) which halted the German advance. 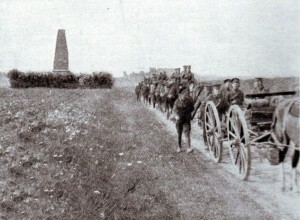 The Armies that marched off to war and clashed in August 1914 operated on essentially 19th century doctrines, large units of riflemen were screened by cavalry and supported by artillery. However unlike any war before all the Armies were now equipped with the new technologies of aircraft, machine guns and could deploy and be re-enforced more quickly using the new European railway systems. No large scale conflict had ever been fought before with these new tools of war. In addition Armies now consisted of millions of men not 10s or hundreds of thousands as was the case in the previous century. The British, French, Germans, and Russians that marches off the war in August 1914 all assumed that the War would be over in a few months if not weeks. No one anticipated a struggle that would endure over 4 years. Sweeping manoeuvres exposed the cavalry and infantry to the killing power of modern weapons. Such weapons, especially artillery and machine guns as well as accurate rapid-fire rifles proved devastating, especially when used against the tactics field commanders employed in the initial phases of the War. Field operations by 1916 had, after the loss of millions, been fundamentally changed. The professional armies of 1914 were devastated and were replaced by conscripted replacements. 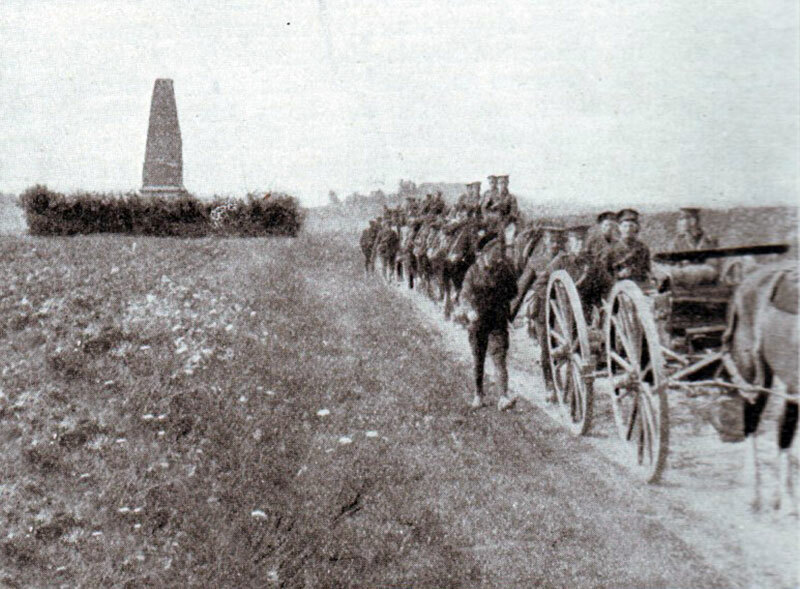 The small BEF force, numbering 68,000 men, met the German right wing on 23rd August 1914. Prior to this the Germans had also clashed with the French Armies on the British right. Both the French & British initially fought the Germans to a standstill but it soon became apparent that they were in severe danger of being overwhelmed by weight of numbers. There then followed a tactical retreat towards Paris. Rats, mice and body lice abounded through all trenches, this, coupled with the inability to bury the dead who lay out in no-mans land, meant life was pretty miserable for both sides. The time spent by a particular soldier at the front was usually relatively brief, from one day to two weeks before being relieved. Von Kluck, the German commander, did not at first give chase, choosing instead to address the heavy casualties inflicted earlier by the British at Mons. Ultimately however he inflicted almost 8,000 casualties upon the British rear-guard at the Battle of Le Cateau on 26 August. During the BEFs exhausting retreat back to the River Marne some 250 miles away, the tiny British force remained in contact with both the French Armies and enemy forces. Discipline and courage saved the BEF from total annihilation. 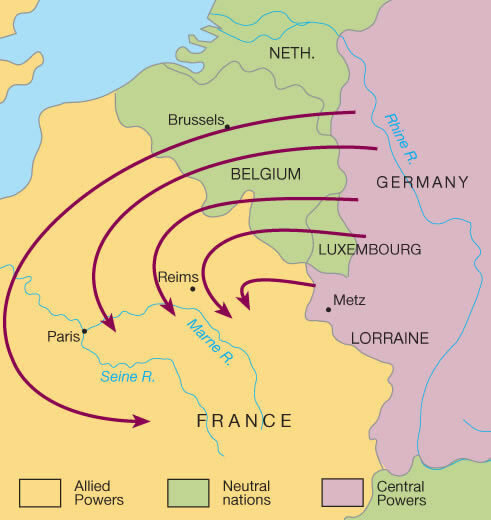 It was during this pursuit that the Germans started to deviate from the Schlieffen plan and rather than encircle behind Paris they moved east in front of the capital. The exhausted allies eventually turned to face the Germans on the river Marne in front of Paris on 6th September 1914. By the time the battle had finished on 12th September the allies had successfully pushed the Germans back across the river. Both sides were exhausted and had incurred huge casualties. Some 250,000 French soldiers were lost with the Germans also suffering about the same number of casualties. The BEF lost just under 13,000 men. However, Paris was saved and the Germans expected outcome of the Schlieffen Plan had faltered. After the Battle of the Marne in September, 1914, the Germans were forced to retreat to the River Aisne. With their lines of communication now being extended and both sides having fought each other to a standstill they chose to dig in.It was German commander, General Erich von Falkenhayn, who decided that his troops must at all costs hold onto those parts of France and Belgium that Germany still occupied. Falkenhayn ordered his men to dig trenches that would provide them with protection from the advancing French and British troops. The Allies soon realised that they could not break through this line and they also began to dig trenches. 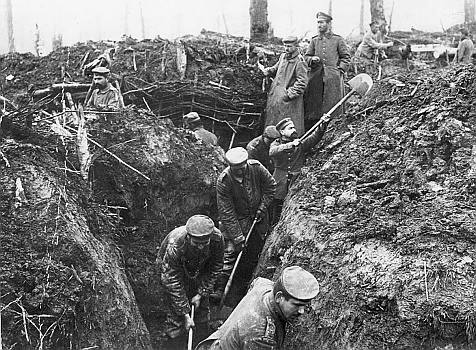 The first ‘real’ trenches being dug by the Germans on 16 September. There then began a series of attempts by the allies to out-flank the Germans which led to “the race for the sea”, the sea in question being the English channel. Neither side was able to overcome the others entrenched positions with the new weapons of war the machine gun , aircraft & train network. Once dug in, it was these that were primarily responsible for the inability to advance or outflank the enemy. The technology of defence was better than that of offence. As the Germans were the first to decide where to stand fast and dig, they had been able to choose the best places to build their trenches. The possession of the higher ground not only gave the Germans a tactical advantage, but it forced the British and French to live in the worst conditions. Most of this area was rarely a few feet above sea level. As soon as soldiers began to dig down they would invariably find water two or three feet below the surface. Water-logged trenches were a constant problem for soldiers on the Western Front throughout the war. After a few months these trenches had spread from the North Sea to the Swiss Frontier, a distance of over 450 miles. Frontline trenches : Frontline trenches were usually about seven feet deep and six feet wide. The front of the trench was known as the parapet. The top two or three feet of the parapet and the parados (the rear side of the trench) would consist of a thick line of sandbags to absorb any bullets or shell fragments. Fire-step : In a trench of this depth it was impossible to see over the top, so a two or three-foot ledge known as a fire-step, was added. Fire-bays and traverses : Trenches were not dug in straight lines. Otherwise, if the enemy had a successive offensive, and got into your trenches, they could shoot straight along the line. Each trench was dug with alternate fire-bays and traverses. Duck-boards, dugouts and funk holes : Duck-boards were also placed at the bottom of the trenches to protect soldiers from problems such as trench foot. Soldiers also made dugouts and funk holes in the side of the trenches to give them some protection from the weather and enemy fire. Barbed-wire : The front-line trenches were also protected by barbed-wire entanglements and machine-gun posts. Saps : Short trenches called saps were dug from the front-trench into No-Man’s Land. The sap-head, usually about 30 yards forward of the front-line, were then used as listening posts. 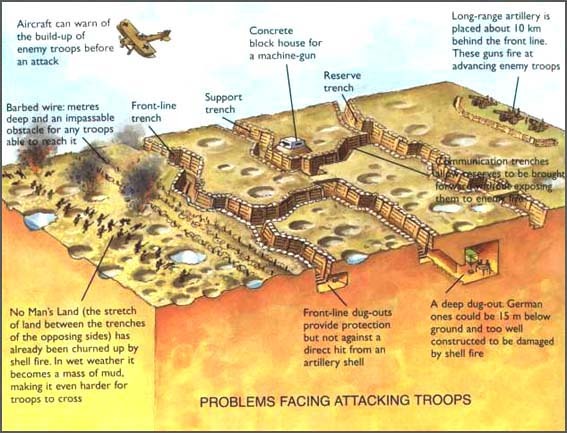 Support & reserve trenches : Behind the front-line trenches were support and reserve trenches. The three rows of trenches covered between 200 and 500 yards of ground. Communication trenches, were dug at an angle to the frontline trench and was used to transport men, equipment and food supplies.